I launched Nicole’s Art Spot at the Gorse Mill Art Studios building in September 2017. The building is a former textile factory, renovated to create art studios and the Gorse Mill Gallery. My fellow artists here include ceramicists, glass blowers, painters, sculptors, mosaic artists, silk painters and fiber artists, jewelers, photographers, authors, illustrators, stained-glass artists, graphic designers, mixed-media artists, and a storyteller. 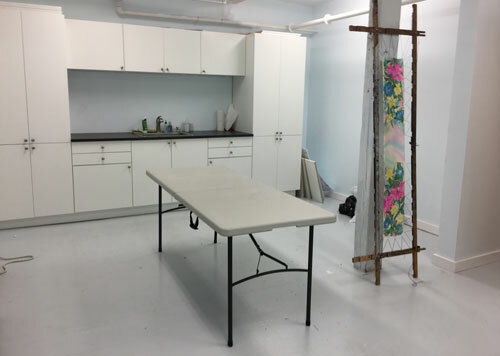 Several of them also offer classes in their studios. The Gorse Mill Gallery features a new exhibit each month through the end of the year. For more information, visit www.gorsemillstudios.com. I have been teaching art to children in after-school settings and community education programs for more than ten years. I worked at the Cabot After School Program in Newtonville for seven years and was the lead art teacher at the Thompson After School Program in Arlington for three years, developing art curriculum for elementary school–aged children. I have taught arts and crafts to children through Newton Community Education’s (NCE) summer program for six years and at Arlington Center for the Arts (ACA) for three years. I have also taught silk painting and Nuno felting to adults through both these community education programs. I also have been painting on silk with dyes for more than fifteen years, creating unique one-of-a -kind silk scarves, clothing and fine art. My work is sold at juried art festivals throughout the Boston area, at several art galleries including the Cambridge Artists Cooperative, and through my Etsy site. You can view my hand painted silks at Silkendreams.com. I have a BA in art history from Boston University and has taken numerous courses in fine arts at the Massachusetts College of Art and numerous community education programs. I have participated in the Silk Painters International Biannual Silk Painting Conferences for over fifteen years, studying with silk artists from all over the world. I am certified in CPR and first aid. I believe children as well as adults thrive with intimate individual attention and encouragement. 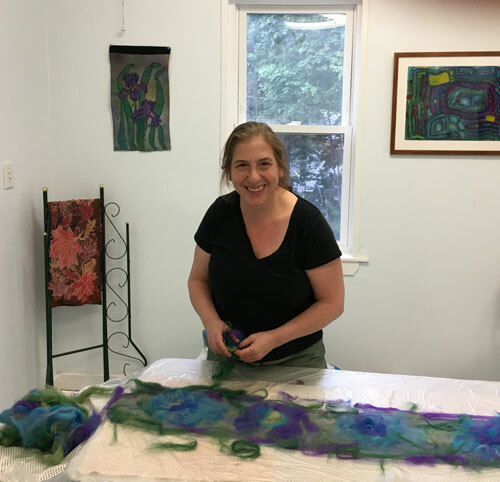 My classes encourage individual creativity, exploration, experimentation and self-discovery, with a special focus on the fiber arts. My environment fosters self-esteem, where students leave proud of their accomplishments and new skills. Children can delve into art and craft media that interests them the most and I tailor projects that meet their specific interests.